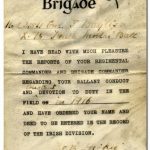 I have always been interested in the gallantry certificates of the three divisions raised in Ireland, about which there is very little information in a single source. I would be very grateful for contributions that support or contradict my comments. 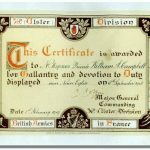 In addition to the array of British and foreign decorations and medals awarded for gallantry during the First World War, many British Army divisions awarded certificates that recognised brave conduct brought to the notice of the divisional commander. 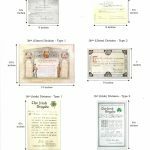 The certificates were produced in various formats and were of varying quality—some were of simple design and printed locally, others were more ornate and printed in the United Kingdom. The numbers awarded are impossible to determine. 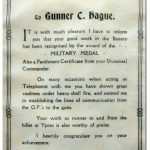 Many were instituted before the Military Medal came into being in March 1916 and, as the Military Medal became widely and more frequently awarded, these certificates became less common. Nonetheless, they continued to be awarded, in some divisions, and in various formats, throughout the war and they often preceded the award of a gallantry medal or decoration for the same act. 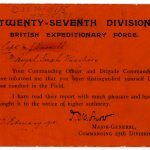 Details of awards may be found in unit and formation war diaries and in local newspapers but these records are inconsistent. All three of the divisions raised in Ireland produced such certificates (see the photo gallery for examples and dimensions). A later example from Salonika (albeit for earlier actions in Serbia) is also typewritten, with a slightly altered inscription and signed by Brigadier General Lewis Loyd Nicol, who had commanded the Division temporarily. In this case, the recipient was recommended successfully for a Serbian award. It is not known if similar awards were made for bravery in Palestine before the Division was reorganised and ceased by to be ‘Irish’. It should be noted that the certificate—soon nicknamed the ‘Hickie Parchment’ or ‘Hickie’s Medal’— was awarded in large numbers and in addition to any other decoration or medal that might accrue, rather than instead of them. Note in the example below that the additional word ‘constant’ has been added in ink above the space before ‘devotion’; several examples of this amendment exist and they appear to have been written at the same time. This first type was awarded from the institution of the Parchment in February 1916 to the early summer of 1917, including for bravery during the first actions at Loos in March and April 1916, at Guillemont and Ginchy in September 1916 and at Messines in June 1917. 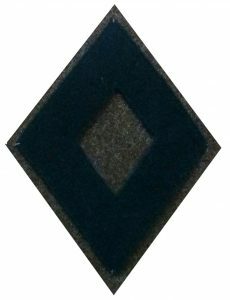 From the autumn of 1916, the award of the Parchment was indicated by a hollow, dark green, felt diamond worn on the right upper sleeve of the uniform tunic. It was known as the ‘Guinchy diamond’ and was first used in conjunction with the awards made for the fighting in September 1916. A second, more ornate version of the Parchment was awarded from the latter part of 1917, with earliest examples being known from the Battle of Langemarck on 16 August and the Battle of Cambrai; in the case of the latter for the actions on 20 November during the attack on Tunnel Trench. This second version was much the same as the first but it had an added meander border, at the top was inscribed the motto ‘Everywhere and Always Faithful’, and the first letter of the main text was enlarged and decorated with an oak leaf design. This version was almost identical to that used by 29th Division from late-1917—it is not known which was the inspiration for the other. Almost destroyed during the German offensive in March 1918, 16th (Irish) Division returned to England and was reorganised and ceased to be an ‘Irish’ division. The gallantry certificate was retained but redesigned. Smaller and now titled ‘16th Division’ in red lettering between ornate scrolls, with similar text to the original, and the soldiers name, unit, and the date and place of the act handwritten in ink. One soldier (probably uniquely) is known to have received all three versions of the Parchment. Private Ned Brierley earned his first award with 8th Royal Dublin Fusiliers at Ginchy on 9/10 September 1916; the second during the Battle of Langemarck on 16 August 1917 (actions which also earned him the Military Medal); and the third, after having transferred to the Royal Engineers, with No. 3 Section, 16th Divisional Signal Company in support of 48th Infantry Brigade at Douvrin (coincidentally, not far from where Corporal Hogan had earned the very first award) when he repaired forward lines ‘under shellfire’ on 8 October and repaired a forward line to a trench mortar battery on 9 October. Two other variants of the 16th (Irish) Division parchment are known. Both appear to be locally produced by the Divisional Artillery, or one of its units. 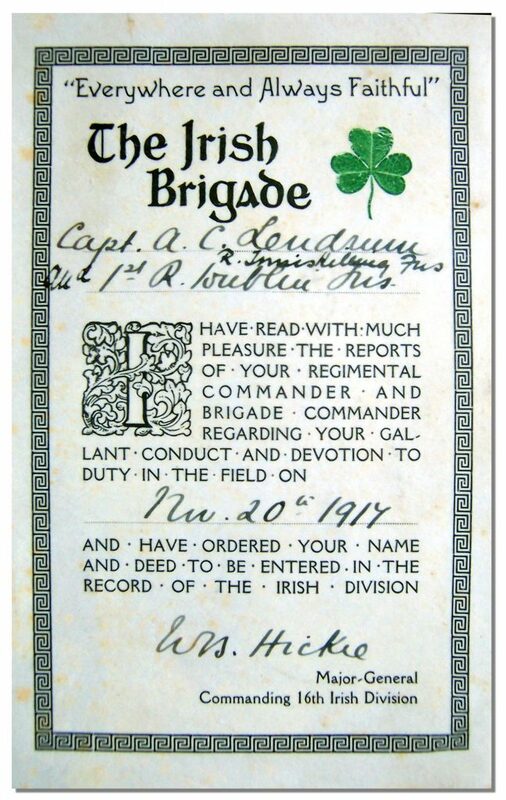 The first variant replicates the Type 2 parchment but with a simplified border and first letter of the text, the green shamrock is omitted, and the ‘signature’ of Major General Hickie is printed. The second variant is a notification of an award. It is in the style of the first variant (seemingly by the same printer) but with very different text. Both of these variants, to Gunner C Hague of V.16 Heavy Trench Mortar Battery Royal Field Artillery, may be seen in the gallery below. 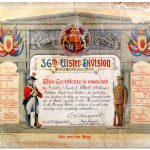 The two certificates awarded by 36th (Ulster) Division were presented in a very different fashion to those for 16th (Irish) Division. 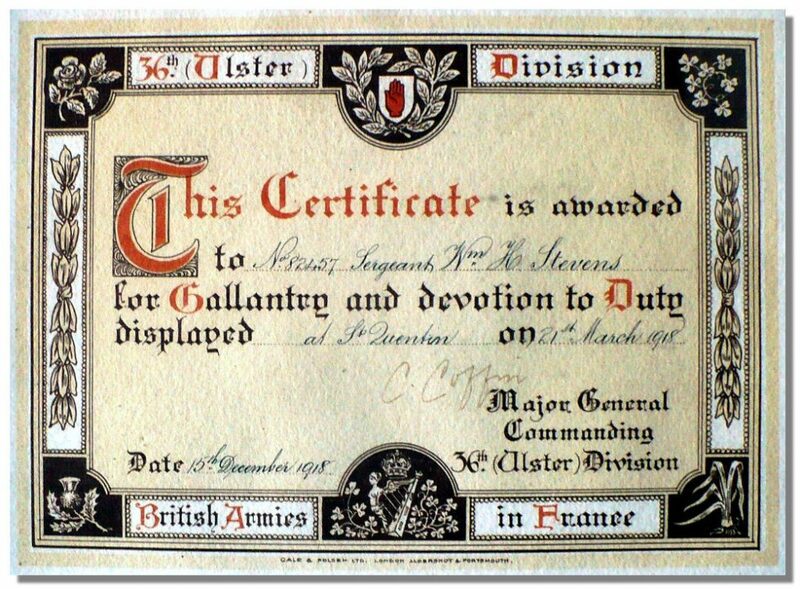 Somewhat surprisingly, given the impeccable organisation of 36th (Ulster) Division, the Certificate for Gallantry was not instituted until the spring of 1917. It was used primarily to reward men who had distinguished themselves during the attack on 1 July 1916 (and the preparatory period prior to it and in its aftermath). The first awards of the certificates were made to men of The Royal Irish Rifles dated 2 April 1917, nine months after the attack; they began to appear in newspapers at the end of the month. This was the most ornate of any divisional certificate. Designed by the illustrator and painter Joseph William Carey and printed by Carey and Thompson Ltd., Royal Avenue, Belfast, the large certificate was replete with symbols linking the Division to the Ulster Volunteers and the Union with Great Britain. In front of a classical building stand two soldiers titled ‘An Ulster Volunteer 1800’ (the year of passage of the Acts of Union and the immediate aftermath of the defeat of the United Irishmen) and ‘An Ulster Volunteer 1914’; the latter dressed in wartime uniform and on his shoulder wearing the battle patch of 9th Royal Irish Rifles. Between the columns on either end of the building are listed the units of 36th (Ulster) Division, with the infantry battalions, machine gun companies and trench mortar batteries on the left and divisional troops on the right, reflecting the Division’s organisation in late-1916/early-1917. On either side of the upper façade of the building is the Red Hand of Ulster within a shield and surmounted by a crown behind which is arranged the flags of the Allies. In the centre of the upper facade is a scroll split by the Royal Arms inscribed ‘For King, country and home’. Central to the certificate under the Division’s title, neatly and carefully hand written in ink, appear the number, rank and name of the soldier, his unit and the details of the act for which the certificate was awarded. At the very bottom of the certificate was inscribed ‘God save the King’. 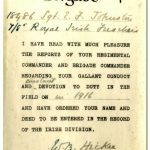 The certificates appear to have been issued in batches by unit—for example, all the awards to 9th Royal Irish Fusiliers for 1 July 1916 are dated 25 August 1917. 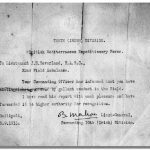 Other actions in 1916 were also rewarded with retrospective certificates signed in the summer of 1917—for example, an award dated July 1917 for an act of gallantry near Messines on 4 October 1916. 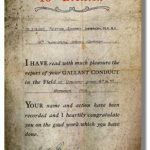 Note that there is no evidence that this type of certificate was used as an immediate award for gallantry in the actions that took place after its institution in the summer of 1917. 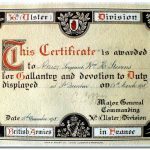 It is clear, however, that awards were made in retrospect from August 1918 and, indeed, after the war had ended, for acts of gallantry in 1916 and up to, and including, the Battle of Messines in June 1917, which appears to be the last action for which this type of certificate was used. Examples include: an award made in August 1918 for gallantry during a raid just prior to the attack at Messines, and a certificate issued after the war in January 1919 for gallantry at Messines in August 1916. The certificates dated 1919 appear to have been presented to soldiers prior to demobilisation. 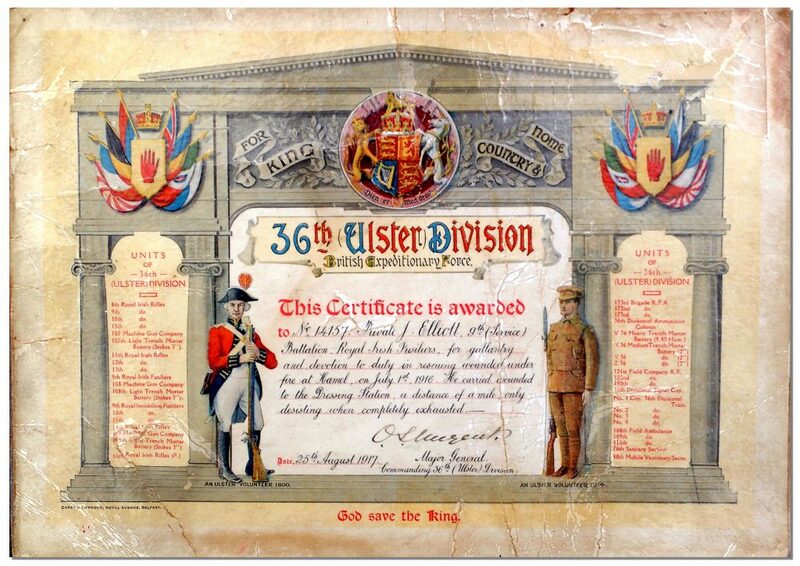 A second and very different certificate for 36th (Ulster) Division was produced in late-1918. In February 1918, 36th (Ulster) Division had undergone a significant reorganisation—six service battalions were disbanded and three regular Irish battalions joined the Division. In addition, men arrived from disbanded battalions in 16th (Irish) Division. Since late-1916 the Division had also received many English soldiers in reinforcement drafts. In consequence, the Division was an amalgam of Irish and English, Protestant and Roman Catholic, regular soldiers, special reservists, volunteers and conscripts. In May 1918, Major General Nugent left and was replaced by Major General C Coffin VC, DSO. The new certificate was very different to the first but it was also very elaborate. It was printed by Gale and Polden Ltd. in Aldershot—a company well known for its production of printed material of all kinds for the Army. The certificate, somewhat smaller than the original, is printed on stiff, cream paper in red, black and white. It has a cleverly designed, ornate border with symbols that reflect the make-up of the Division in 1918. In the top centre is the Red Hand of Ulster within a white shield, surrounded by a laurel wreath; in the bottom centre is a crowned, Irish-maiden harp surrounded by shamrock. In each of the four corners are the national plants of the nations of the United Kingdom—the shamrock, the leek, the thistle and the rose. Laurel leaves decorate the vertical borders and the top and bottom borders are inscribed ‘36th (Ulster) Division’ and ‘British Armies in France’, respectively. The centre of the certificate is given over to ornate, printed script with the recipient’s name, the location of the act of gallantry and the date of the act added in ink. It is not known when the second type was instituted but, based on the available evidence, it may be concluded that these certificates were for actions from mid-1917 and were awarded in retrospect in a process that began after the war had ended and before demobilisation began in mid-January 1919 (in conjunction with a process to issue some of the earlier type certificates for actions in 1916 and early-1917). There is no record of posthumous awards being made. The earliest awards of this second type were for gallantry during the Battle of Langemarck on 16 August 1917. The earliest date on these certificates, which was in ink and always in the same style and hand as the details of the recipient, is 15 December 1918. Certificates were dated as late as February 1919. All were signed by Major General Coffin. There does not appear to be a correlation between the date of the action and the date on the certificate. 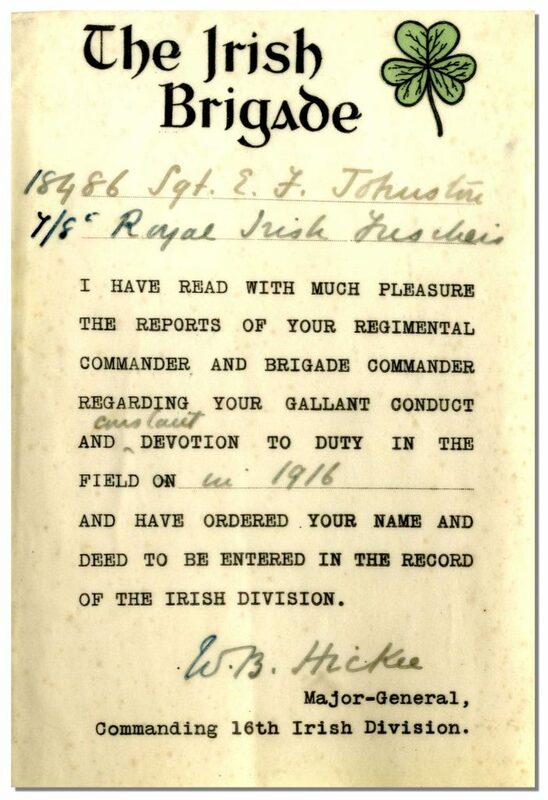 The Royal Dublin Fusiliers Association Archive for permission to use the image of the 16th (Irish) Division certificate to Sapper E Brierley. The Royal Irish Fusiliers Museum for permission to use their images of the various certificates. Jonathan Maguire for the images of the Guinchy Diamond and the certificates awarded to Gunner C Hague. 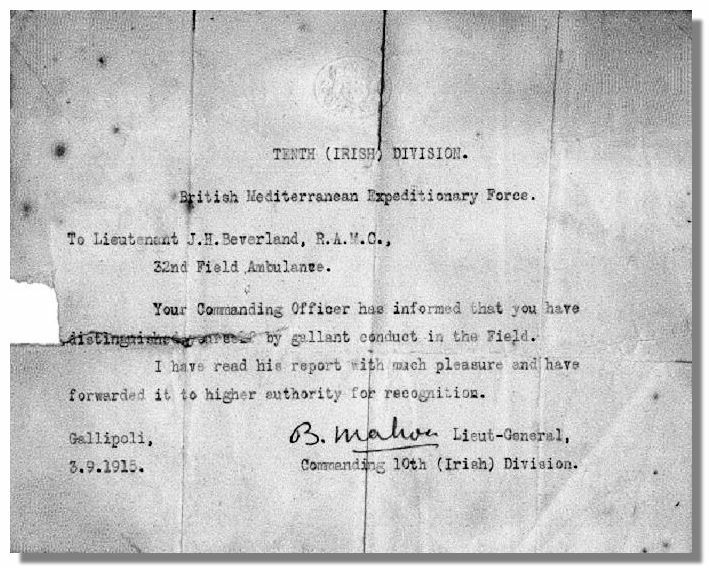 John Bayliss for permission to use the image of the 16th (Irish) Division certificate to Gunner J. M. Bayliss. The family of J. H. Beverland for the image of the 10th (Irish) Division certificate. Graham Stevens for the photograph of the 36th (Ulster) Division certificate to Sergeant W. H. Stevens. 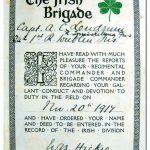 Geoff Symons for permission to use the image of the 16th (Irish) Division certificate to Captain A. C. Lendrum. ‘A very busy day for field ambulances. Many casualties resulted today from shrapnel & these & remainder of wounded from yesterday’s fighting had to be brought in. I spent from 6 pm 15.8 to 7 am this morning at the advance dressing stations & front & can testify to that considering the conditions wounded were got in to advance dressing stations very quickly. The country consists of steep, rocky hills covered with bushes amongst which wounded are difficult to find. Bearers have been working hard all day. O.C. 32 Field [Ambulance] has brought to notice the coolness of Lt Beverland under heavy shrapnel and rifle fire.’ (The National Archives. Public Record Office. (July 1915-October 1915). 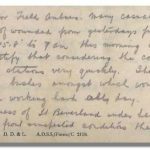 Assistant Director of Medical Services 10th (Irish) Division War Diary. WO 95/4294. Lieutenant J H Beverland was later mentioned in despatches for his gallantry in Salonika (London Gazette 21 July 1917. Issue 30196, page 7455.) and awarded the Military Cross for his gallantry in 1918 with 165th Indian Combined Field Ambulance in Palestine (London Gazette 1 January 1919. Issue 31093, page 56.). 2. 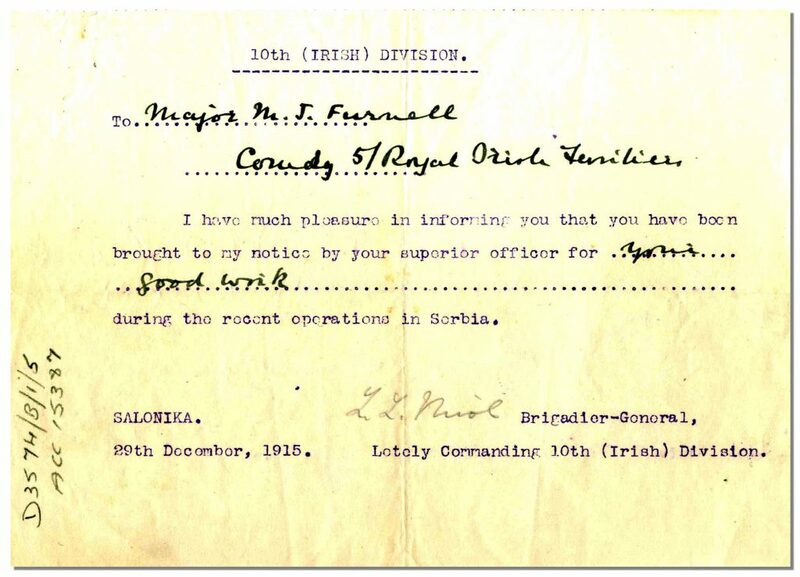 (Back) This award to Major Michael John Furnell, Commanding Officer of 5th Royal Irish Fusiliers, was announced at a parade at Hortakoj Camp on 2 January 1916. 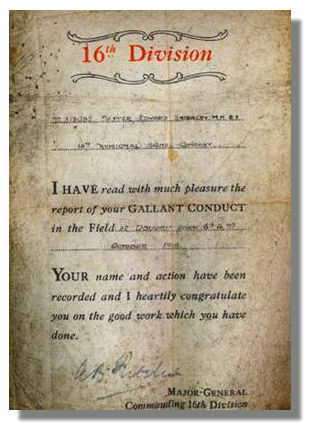 The award was referred in the Battalion’s war diary as a ‘mention’. In addition to Major Furnell, Captain Edward Sidney Chawner Grune (attached from the Bedfordshire Regiment), Second Lieutenant Henry Erskine Sherrard, 5/11543 Sergeant Albert Buckler, and 5/12269 Corporal Robert Gibney were also ‘mentioned’; all except Sherrard subsequently received Serbian awards—see London Gazette 21 April 1917. Issue 30030, page 3285. 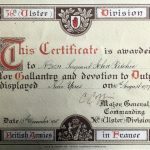 Major Furnell had earned a similar certificate while serving as a Captain with 2nd Royal Irish Fusiliers in 82nd Brigade, 27th Division in Flanders in January 1915—see the gallery. 3. (Back) Major General William Bernard Hickie CB, General Officer Commanding 16th (Irish) Division, December 1915-February 1918. Later Major General Sir William Hickie KCB. 4. (Back) The account of the inspection and Hickie’s speech by the ‘Press Association’s Special Correspondent’ were syndicated to numerous newspapers, appearing on 19 February 1916. See, for example: ‘An Irish Battalion in France.’ (19 February 1916). The Belfast Newsletter. p 5. 5. (Back) Description of the award as ‘the first distinction conferred on a soldier of the Irish Brigade’: ‘Limerick Soldier Honoured’. (1 April 1916). The Weekly Freeman. p 5. The act is deduced from the Battalion war diary: The National Archives (TNA). Public Record Office (PRO). (December 1915-November1916). 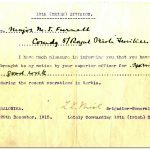 War Diary, 8th Royal Munster Fusiliers. WO 95/1971/2. 6. (Back) 8th War Diary Op. Cit. 7. (Back) 3682 Corporal Patrick Hogan; he has no known grave and is commemorated on the Loos Memorial, Panel 127. 8. (Back) Award to 18486 Sergeant Ernest F Johnston, 7th/8th Royal Irish Fusiliers, in 1916. See also the Parchment to L/31561 Bombardier J. M. Bayliss, X.16 Trench Mortar Battery, Royal Field Artillery. A third identical example is known to Second Lieutenant A. C. Young, 7th/8th Royal Irish Fusiliers. 9. (Back) Wheeler-Holohan, V. (1920). Divisional and Other Signs. New York: Dutton. p 49. 10. (Back) The motto Semper et ubique Fidelis (Always and Everywhere Faithful) was bestowed on the Irish Brigade for its service to France by the Count de Provence (later Louis XVIII) in 1792. The motto of 16th (Irish) Division—Everywhere and Always Faithful—was adopted by Major General Hickie in December 1916, and in the Second World War was used by 38th (Irish) Brigade (Ubique et Semper Fidelis). 11. (Back) 20041 Private Edward Brierley, 8th (Service) Battalion, The Royal Dublin Fusiliers. London Gazette 19 November 1917. Issue 30389, page 11963. 12. (Back) Earned as 313085 Sapper Edward Brierley, 16th Divisional Signal Company, Corps of Royal Engineers. See: TNA. PRO. (December 1915-May1919). 16th Divisional Signal Company War Dairy. WO 95/1966/1. 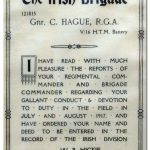 His certificates may be found in The Royal Dublin Fusiliers Association Archive, Dublin City Library and Archive, 138-144 Pearse Street, Dublin. 13. (Back) See: ‘Certificates for Gallantry’. (30 April 1917). The Belfast News Letter. p 8—awards to 6915 Rifleman J Leckey, 16th Royal Irish Rifles, 18759 Sergeant James Shields, 14th Royal Irish Rifles, 19514 Corporal Wilfred Jonathan Gibson, 14th Royal Irish Rifles, and 16584 Rifleman William Heasley, 14th Royal Irish Rifles; all of whom appeared in a longer list the following day. 14. (Back) The battle patches were worn to distinguish between units. 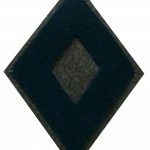 The inverted triangle was won by the units of 107th Brigade, a semi-circle was won by 108th Brigade and a rectangle by 109th Brigade. A complete depiction of these by Michael Chappell appeared in Military Illustrated in August 1991. 15. (Back) The award to 19117 Private Robert Harbinson, 10th Royal Inniskilling Fusiliers. ‘…for great devotion to duty in the Spanbroek Sector as Stretcher Bearer on the night of 4th October, 1916. During enemy bombardment he rendered first aid to several men and dug out three men who were buried, being exposed to machine gun fire all the time.’ See: <www.belfastforum.co.uk>. 16. (Back) The award to 18397 Rifleman Robert Marks, 13th Royal Irish Rifles, ‘…for gallantry during a successful daylight raid on the enemy trenches near Wytschaete on 3rd June, 1916, when he went to the assistance of comrades in difficulty, helped to beat off the enemy, and returned with prisoners.’ See: ‘Ulster Division Certificate’. (21 August 1918). The Belfast News Letter. p 3. 17. (Back) The award to 43266 Lance Corporal William Harrison, 9th Royal Irish Fusiliers, ‘…for his gallantry on patrol on 14 August, 1916, when four Germans were captured, and on 11 October, 1916, on which occasion he rescued two wounded men from the German wire.’ See: ‘News from Mid Derbyshire.’ (18 January 1919). The Courier. p 6. This entry was posted in First World War, Gallantry on April 10, 2017 by Nick Metcalfe. This is fascinating Nick. I’ve always wondered about these certificates. Now I know! Thanks for the information Nick, I have one of the later Ulster Division certificates, issued to my Grandfather, William A Campbell for his actions near Neuve Eglise, 6th September 1918. He was a driver with the 109th Field Ambulance, ASC. Thanks – also for sending me a photo of it. I’ll add it to the gallery.